Our "Starfish" Craft stencil is a great way to add a little beach house decor to any space. This stencil pattern is great for those smaller DIY stencil projects. Nautical designs are a great way to bring comfort and class to your decor and stencils make it easy and fun! Our trendy craft stencils are great for creating your own designer stenciled pillows or curtains. Upcycle a garage sale furniture find by giving it a modern stenciled designer look . Creativity doesn't end there: try stenciling lamp shades, kitchen backsplashes, doors, table tops, picture and mirror frames or create your own work of art on pre-stretched canvas. Decorative possibilities are endless with these versatile reusable craft stencils! Although usually it is not necessary to use spray adhesive with our stencils, adhesive can very helpful if you want to minimize paint seepage or are using high contrasting colors. (regular Elmer's spray adhesive seems to be the best). Make sure you shake the can well and lightly mist (not drench) the stencil, and let it dry for a moment before positioning it. This step will prevent the adhesive residue transferring to your surface. You'll need to re-mist the stencil after a few repeats. Clean-up tip: Spray the stencil with Simple Green to help to remove adhesive residue. When stenciling on furniture, you want to insure good adhesion. If the piece has a varnish or a glossy finish you'll need to break the sheen. You can do this with a scotch brite pad, steel wool or fine grit sandpaper. Lightly sand the surface and then wipe down the piece with a damp cloth or paper towel. Next, basecoat the piece if you want to change the overall color. Most acrylic and latex paints work well, but to insure good adhesion you may want to use an adhesive primer such as Stix or Zinnser 1*2*3. These primers can even be tinted to the color you want. After your primer/basecoat is dry you can start stenciling with whatever paint you like. FolkArt acrylics and Benjamin Moore paints work great. You can just tape your stencils with pieces of blue painters tape, or use spray adhesive for a crisper look. If you want to protect your artwork, you could then topcoat the table with a clear topcoat (spray or brush-on). Textile medium is optional: it only makes the acrylic paint more flexible when it dries, which is important for wearables like t-shirts but not so much for pillows and curtains. Complete the stenciling and let it dry fully, 24 hours is best, then heat-set it by ironing the fabric for about 20 sec. ( more or less) on a LOW setting through the piece of cloth. Heat-setting will cure the paint and will prevent it from being washed off in the washing machine. Always experiment first stenciling on a sample of your fabric to ensure good results. I've stenciled on silk, cotton, linen and even sheer fabrics with great results. It's always better if your fabric doesn't have too much texture. Please make sure you watch our short step-by-step <ahref="/how-to-stencil-videos.html" alt="how-to-stencil-video">Video Tutorials! Need some stencil inspiration or looking for stencil room ideas? 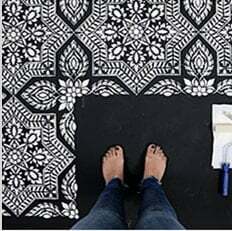 Check our our Stencil Stories Blog it's packed with expert stenciling advice for DIY decor, illustrated step-by-step tutorials, room ideas and style advice and color inspiration. Decorating in Beach style? Check out our entire Beach Decor Stencil collection for more ideas for that breezy, beach house vibe you're trying to bring to your room! Our wall stencils are made out of durable 12 mil clear plastic stencil material. This material is strong but flexible, reusable and easy to clean. We love it so much more than standard 5-8 mil Mylar! It's not brittle, user friendly and just so easy to work with. In our many years of professional stenciling this material has proven to be far superior in quality to any other stencil material we used. Our customers love it too, and we are sure that you'll notice the difference! Our stencils will last a long time and are a pleasure to use.